It’s That Time of Year – Medicare Enrollment! 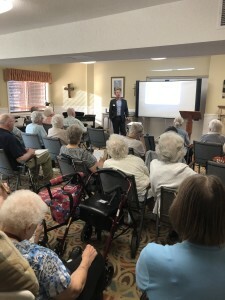 Recently, at Copperfield Hill we welcomed Grant Rockwood, MBA / CRPC and Principal at MN Benefits to come speak about the upcoming changes that those 65 and older will face this coming fall with Medicare enrollment. As many already know, some of the plans that are options now, will be changing and or eliminated. Grant delivered an informational presentation on the overall program and outlined some of the new options for coverage. Specific information is not available until October 1, 2018. 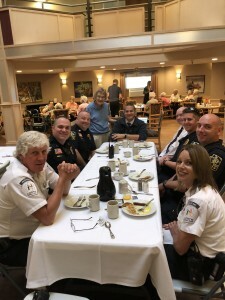 On Tuesday, September 11, 2018, Copperfield Hill had the honor of hosting local first responders for breakfast. This year we welcomed members from our local police, fire and EMT departments. It is an opportunity for us to recognize and thank them for the contributions that they make every day. Copperfield Hill is looking forward to celebrating National Assisted Living Week. Each year, we celebrate the vibrant lives of our seniors. *”​Established by the National Center for Assisted Living (NCAL) in 1995, National Assisted Living Week® provides a unique opportunity for residents, their loved ones, staff, volunteers, and the surrounding communities to recognize the role of assisted living in caring for America’s seniors and individuals with disabilities. 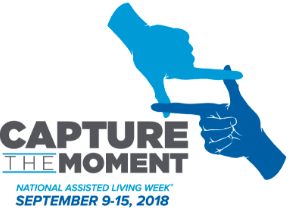 “Capture the Moment” is this year’s theme for National Assisted Living Week, which hopes to inspire residents to realize their dreams and seize the day. Simultaneously, the theme also supports reflection, as residents may look back on the pivotal moments in their lives. With the theme’s word play referencing photography, residents may refer to pictures or videos from their past. Each year thousands of people are diagnosed with Alzheimer’s disease. It is just one of hundreds of types of dementia. Raising awareness and funds for research are two main missions for the Alzheimer’s Association. Here at Copperfield Hill, we support the Alzheimer’s Association by fundraising and participating in The Walk to End Alzheimer’s. For more information about early detection, caregiving and research please click on the link below.